The official Twitter app gets improvements on Discover tab, Search and Notifications in new update for both iOS and Android. The Discover tab helps you find interesting and timely content that matters to you. 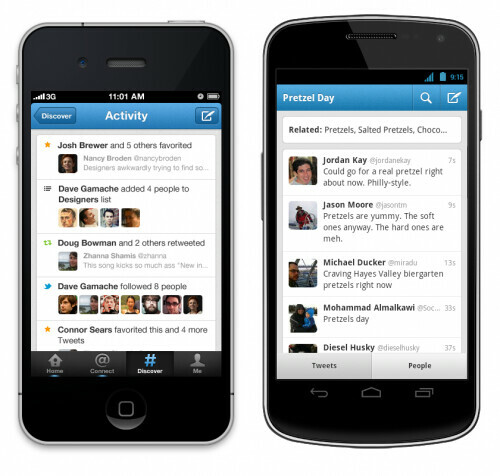 With this update, you can see Activity on Twitter for iPhone and Twitter for Android. Activity is a stream of updates that shows which Tweets are favorited or retweeted by the people you follow and which accounts those people follow or add to lists. Search is now simpler in both mobile apps. You can see suggestions for different spellings and related terms for your queries. Finding the people you’re looking for is faster, too. In the Connect tab, you can start typing the first or last name or username of the person you’re looking for and the name will autocomplete for people that you follow. We’ve also made a few improvements specifically for iPhone: when you tap the search box in Discover, you’ll see your most recent queries. You can also go directly to someone’s profile when searching for a username in Connect. Lastly, we’ve added push notifications for Interactions, so you can know immediately when your Tweets have been retweeted or favorited, or when somebody new follows your account. You can manage your push notifications settings to stay as connected as you’d like. You can get the app for free from the App Store.